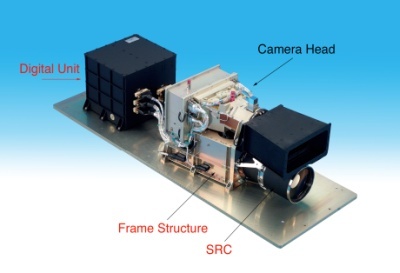 The High Resolution Stereo Camera (HRSC) is a multi-sensor pushbroom instrument comprising multiple charge coupled device (CCD) line sensors mounted in parallel for simultaneous high-resolution stereo, multicolour and multi-phase imaging of the Martian surface. An additional Super Resolution Channel provides frame images imbedded in the basic HRSC swath at five times greater resolution. HRSC was originally developed for the Russian Mars 96 mission. Two fully tested and calibrated flight models were produced. The flight spare has undergone a modification process to make it fully compliant with the Mars Express interface requirements. Special emphasis has been placed on achieving low mass and power consumption. The HRSC instrument consists of two components, the Camera Unit (CU) and the Digital Unit (DU) connected by a wiring harness. The Digital Unit comprises a power converter supplying the digital processing electronics and the sensor electronics, a signal interface to the spacecraft, an instrument control processor and a data compression unit, all mounted in a single enclosure. The High Resolution Camera Head contains the optics, the optical bench, the spectral filters, the CCD line sensors, the sensor electronics, and a thermal control system. The optics are of Apo-Tessar objective design with a focal length of 175 mm and f = 5.6, and are mounted in a titanium housing. The transmissivity of the optics varies from 0.37 for the blue channel (440 nm) to 0.68 in the panchromatic range. The HRSC Camera Head contains nine CCD line sensors mounted in parallel for operation in pushbroom mode. Pushbroom or linear array sensors image a line on the planet surface perpendicular to the ground track of the spacecraft and rely on the orbital motion of the spacecraft to reposition them as they record a sequence of images known as an image swath. HRSC simultaneously provides high-resolution stereo, multicolour and multi-phase images of the Martian surface by delivering nine superimposed image swaths. The Camera Head sensor electronics consists of three Focal Plate Modules (FPM), each of which contains three CCDs including drivers and preamplifiers, and a Front End Electronics (FEE) unit comprising four signal chains, nine focal plate controllers and one power distribution unit. Each of the nine CCD linear arrays is made up of 5184 seven-micron square pixels, which correspond to ten metre square pixels on-ground for a spacecraft altitude of 250 km. By multiplexing the nine CCD sensors, the signal can be switched into one of the four signal chains. Signal conditioning comprises low pass filtering, correlated double sampling and programmable attenuation and gain selection. The conditioned signals undergo analogue to digital conversion before being transmitted to the instrument's Digital Unit. The Super Resolution Channel (SRC) consists of a set of optics, a CCD array detector and the associated signal electronics. The SRC optical system is a Matsukov-Cassegrain telescope with a focal length of 972 mm, positioned with its axis parallel to the optical axis of the HRSC Camera Head. The SRC sensor is a CCD array of 1024 × 1032 nine-micron square pixels, which correspond to 2.3 metre square pixels on-ground for a spacecraft altitude of 250 km. The SRC has a mechanical interface with the HRSC Camera Head and an electrical interface with the HRSC Digital Unit. It has no direct interface to Mars Express and is treated by the spacecraft as an additional HRSC channel. Stereo imaging is performed using nadir-directed, forward looking (+18.9°), and aft-looking (-18.9°) line sensors with a spectral range of 675 ± 90 nm. Known as triple panchromatic along-track stereo, this technique permits robust stereo reconstruction by on-ground digital processing and rectification through attitude reconstruction, feature matching and bundle adjustment, followed by the generation of digital terrain models and higher-level products. In general, the nadir-looking channel delivers the highest resolution images, while the two outer stereo channel images will be transmitted at lower resolution after pixel summation. Multi-spectral imaging is implemented using four additional line sensors for the blue (440 ± 45 nm), green (530 ± 45 nm), red (750 ± 20 nm) and near infrared (970 ± 45 nm) colour ranges. These colour images cover the same areas as the panchromatic triple stereo images and will be matched geometrically to the nadir channel panchromatic swath by a process involving digital rectification through post-facto altitude reconstruction. In general, the multi-spectral images will be artificially decreased in spatial resolution by on-board pixel summation for lower data rates and better signal-to-noise characteristics, giving rise to data entities referred to as macro pixels. Two additional panchromatic line sensors having inclined forward and backward viewing directions perform multi-phase imaging. These sensors complement the information contained in the triple stereo channels and allow the determination of photometric surface characteristics. The data from these channels will normally be transmitted at lower resolution by pixel summation. The nine line sensing channels can be allocated to one of four signal chains. Each chain can be operated independently, offering great flexibility in the processing of the data. When the SRC is operated, one of the four signal chains is dedicated exclusively to SRC and the line sensors use the remaining three signal chains. As the spacecraft moves along its ground track, all nine CCD line sensors are exposed for a chosen exposure time and at a selected scan frequency in such a way that a contiguous image strip, having no gaps between adjacent lines, is generated. The exposure time and the scan frequency are closely connected, with the readout time between adjacent lines being negligible. Nine independent image strips are generated. The size of an image strip is defined by the number of pixels per line and the acquisition duration. The cross track dimension (swath width) changes with spacecraft altitude whereas the along track size (strip length) is limited only by spacecraft resources such as memory available to store observation data and allocated downlink capacity. In order to guarantee square pixels the scan frequency has to be varied with changing cross-track pixel size. Thus, the scan frequency depends on the cross track pixel size, which in turn depends on the spacecraft altitude. As a result the instrument data rate changes with spacecraft altitude, reaching its maximum at pericenter. The gain of the HRSC electronics is varied with the changing scan frequency in order to compensate for the variations in the amount of light reaching the CCDs as the exposure duration changes. For a spacecraft velocity over ground at pericenter of 4.3 kms-1 the scan frequency is 425 Hz. The scan frequency decreases as the spacecraft altitude increases. During normal HRSC imaging, nadir pointing of the spacecraft is required. Off-track pointing, where the spacecraft is turned to position the instrument line-of-sight to one side of the ground track, may be used for the acquisition of special targets. The nine CCD line sensors of the Camera Head are located behind a single optical system and each sensor sees the planetary surface with a different viewing angle, which forms the basis for stereo imaging. Each image point is seen from three different viewing angles, forward-looking, nadir-direction and aft- looking. Given an accurate knowledge of the position and attitude of the spacecraft at the time of image acquisition, the absolute three-dimensional position of objects in the images can be calculated. The distance on ground spanned by the stereo viewing angle (nadir to forward-looking or nadir to aft-looking, both 18.9 deg) is called base length. For in-track stereo reconstruction a minimum image strip length of three base lengths is required. At pericenter, this corresponds to an imaging duration of two minutes. To perform a robust stereo reconstruction over mosaics consisting of adjacent image swaths, a sideways overlap of about 20% of the swath width is required.